When I was a kid, I prayed for many blizzards so school could be cancelled and I could play outside all day. Unfortunately, this prayer took almost two decades before it came through, and the sad, cold reality of the snow hit me yesterday. Since I’m a landlord and it’s important for me to to take care of my rental property, I grabbed a shovel and went down to my multifamily house to clear the snow. When I got to the house, I couldn’t identify where the sidewalk started because there was a huge mound of snow that existed between the door and the street. I wanted to turn around and drive back home, but I figured that I would have to face this problem sooner or later, so I might as well tackle it today. The more that I shoveled, the more that I learned some valuable lessons and I am so excited about the lessons that I am going to share them with you all–my e-family! As I stepped into the snow to shovel, I was almost completely buried. The more I shoveled, the more I felt like I wasn’t accomplishing anything except making the snow messier than it was before. It felt like I was shoveling for three hours, but nothing seemed to be getting accomplished (and only actual 15 minutes had passed). While shoveling, people passed and said to me, “oh, you’re still shoveling?! ?” They didn’t realize that only a few minutes had passed by and I felt like I’d accomplished a lot. Time seems to pass by a lot quicker for the bystanders who sit and watch the work happen, but it’s a lot slower for the person doing the work. After I reached halfway in the shoveling process, I wanted to take a rest and tackle the rest of the job the next day, but after I saw how much was already accomplished, I was motivated to finish. Last week I sprained a muscle in my back while moving some heavy furniture and this sprain caused my back to hurt tremendously as I shoveled the snow. Regardless of this barrier, I had to continue shoveling and not let circumstances stop me from finishing the job. The entire time that I shoveled, one of my neighbors stood in his driveway and stared at me. This was awkward, but even more importantly, his sidewalk was not shoveled and full of snow. When I was done, I hopped in the car and drove home, but he was just getting started with the shoveling process. By him watching me shovel, it only irritated me and didn’t benefit him at all. If he shoveled at the same time as me, he would’ve gotten some motivation and accomplished something in the process. At first I did a pretty mediocre job at clearing the snow and I wasn’t happy with the end-product. I couldn’t proudly put my stamp of approval on the task that I just accomplished, so I had to re-shovel the entire thing until it was up to my own standards. This was annoying, but worth it because any job worth doing is worth doing well! I considered paying some teenagers a couple of bucks to shovel the sidewalk and walkway, but I knew that there was a reason why I was shoveling. In the end, I came out with a valuable lesson that increased my endurance and will make me more successful in the long-run. 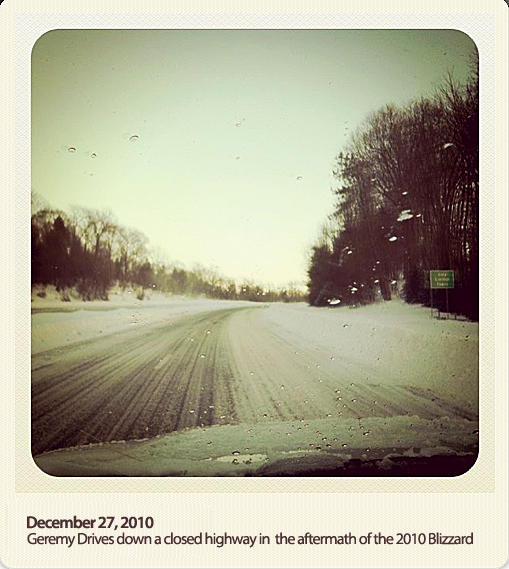 With all of these lessons learned, I am more motivated than ever to enter into 2011! Hopefully this was the last snowfall of the season so I don’t have to learn any more painful lessons!